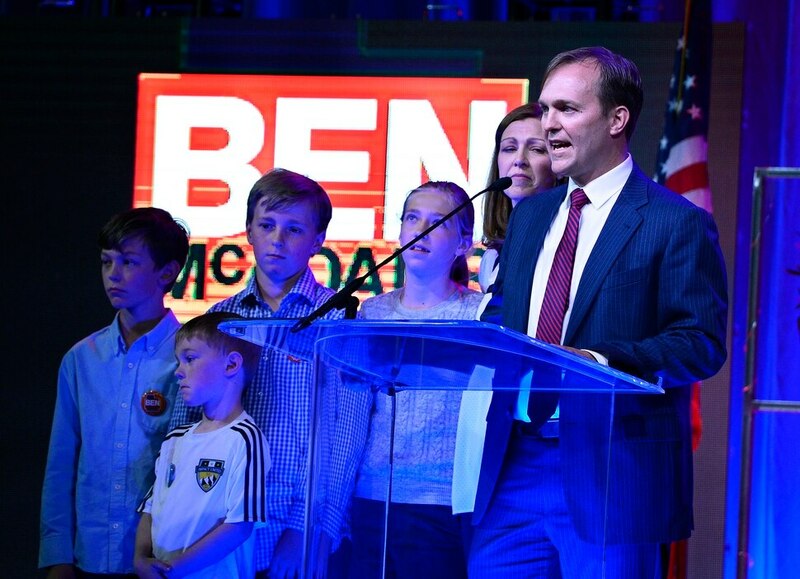 (Scott Sommerdorf | The Salt Lake Tribune) Ben McAdams and his family celebrate just after it was announced that he had won his race at the Democratic convention, Saturday, April 28, 2018 at the Salt Palace Convention Center in Salt Lake City, Utah. McAdams' son Isaac McAdams raises his fist in victory as James and Julie McAdams react. (Scott Sommerdorf | The Salt Lake Tribune) Shireen Ghorbani gets a hug from a supporter as she reacts to her Congressional district 2 win at the Democratic convention, Saturday, April 28, 2018 at the Salt Palace Convention Center in Salt Lake City, Utah. (Scott Sommerdorf | The Salt Lake Tribune) Ben McAdams speaks at the Democratic convention, Saturday, April 28, 2018 at the Salt Palace Convention Center in Salt Lake City, Utah. (Scott Sommerdorf | The Salt Lake Tribune) Keynote speaker Michael Blake fires up the crowd as he speaks at the Democratic convention, Saturday, April 28, 2018 at the Salt Palace Convention Center in Salt Lake City, Utah. (Scott Sommerdorf | The Salt Lake Tribune) Keynote speaker Michael Blake fires up the crowd as he speaks at the Democratic convention, Saturday, April 28, 2018 at the Salt Palace Convention Center in Salt Lake City, Utah. (Scott Sommerdorf | The Salt Lake Tribune) Keynote speaker Michael Blake fires up the crowd as he speaks at the Democratic convention, Saturday, April 28, 2018 at the Salt Palace Convention Center in Salt Lake City, Utah. (Scott Sommerdorf | The Salt Lake Tribune) Candidate in Congressional District 1, Lee Castillo speaks at the Democratic convention, Saturday, April 28, 2018 at the Salt Palace Convention Center in Salt Lake City, Utah. (Scott Sommerdorf | The Salt Lake Tribune) Tom Taylor speaks at the Democratic convention as he throws his support to Darlene McDonald for the Congressional District 4 seat, Saturday, April 28, 2018 at the Salt Palace Convention Center in Salt Lake City, Utah. (Scott Sommerdorf | The Salt Lake Tribune) A supporter holds up a flag and a James Singer card as Singer speaks at the Democratic convention, Saturday, April 28, 2018 at the Salt Palace Convention Center in Salt Lake City, Utah. (Scott Sommerdorf | The Salt Lake Tribune) Candidate Darlene McDonald speaks at the Democratic convention, Saturday, April 28, 2018 at the Salt Palace Convention Center in Salt Lake City, Utah. (Scott Sommerdorf | The Salt Lake Tribune) Candidate in Congressional District 1, Lee Castillo speaks at the Democratic convention, Saturday, April 28, 2018 at the Salt Palace Convention Center in Salt Lake City, Utah. (Scott Sommerdorf | The Salt Lake Tribune) Candidate James Courage Singer speaks at the Democratic convention, Saturday, April 28, 2018 at the Salt Palace Convention Center in Salt Lake City, Utah. (Scott Sommerdorf | The Salt Lake Tribune) Candidate Ben McAdams speaks at the Democratic convention, Saturday, April 28, 2018 at the Salt Palace Convention Center in Salt Lake City, Utah. (Scott Sommerdorf | The Salt Lake Tribune) Candidate in Congressional District 2, Shireen Ghorbani speaks at the Democratic convention, Saturday, April 28, 2018 at the Salt Palace Convention Center in Salt Lake City, Utah. (Scott Sommerdorf | The Salt Lake Tribune) Candidate James Courage Singer speaks at the Democratic convention, Saturday, April 28, 2018 at the Salt Palace Convention Center in Salt Lake City, Utah. (Scott Sommerdorf | The Salt Lake Tribune) Senate candidate Jenny Wilson speaks at the Democratic convention, Saturday, April 28, 2018 at the Salt Palace Convention Center in Salt Lake City, Utah. (Scott Sommerdorf | The Salt Lake Tribune) Senate candidate Jenny Wilson speaks at the Democratic convention, Saturday, April 28, 2018 at the Salt Palace Convention Center in Salt Lake City, Utah. (Scott Sommerdorf | The Salt Lake Tribune) Candidate Larry Livingston created a sensation at the convention when he gave a combative speech and ended it with I'm not stupid!, You're stupid! at the Democratic convention, Saturday, April 28, 2018 at the Salt Palace Convention Center in Salt Lake City, Utah. (Scott Sommerdorf | The Salt Lake Tribune) Senate candidate Jenny Wilson speaks at the Democratic convention, Saturday, April 28, 2018 at the Salt Palace Convention Center in Salt Lake City, Utah. 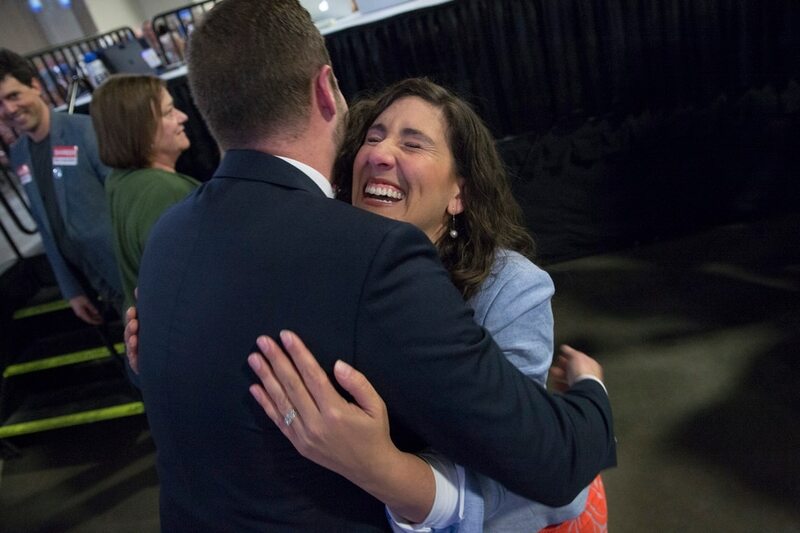 (Scott Sommerdorf | The Salt Lake Tribune) Shireen Ghorbani congratulates James Singer after they both won their respective races at the Democratic convention, Saturday, April 28, 2018 at the Salt Palace Convention Center in Salt Lake City, Utah. (Scott Sommerdorf | The Salt Lake Tribune) Shireen Ghorbani reacts to her Congressional district 2 win at the Democratic convention, Saturday, April 28, 2018 at the Salt Palace Convention Center in Salt Lake City, Utah. There were challengers who said Utah Democrats need liberal candidates to win a seat in Congress, but Salt Lake County Mayor Ben McAdams continued his run right down the middle and convincingly won a spot on the November ballot in his bid to unseat two-term Republican Rep. Mia Love. He collected 72 percent of the vote from delegates at the Utah Democratic Convention at the Salt Palace on Saturday, a healthy cushion above the 60 percent he needed to skip a primary. In this dominantly red state, he is seen as Utah Democrats’ best shot at being part of an anticipated blue wave — which delegates on Saturday were calling a “blue tsunami” — in the national midterm elections. Polling has shown a race between McAdams and Love would be competitive — the only congressional contest in the state where that is true. 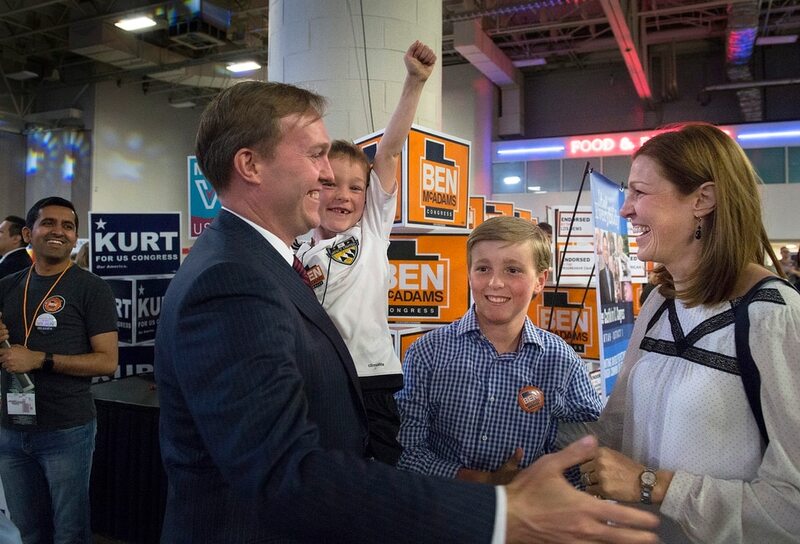 Meanwhile, Salt Lake County Councilwoman Jenny Wilson, too, easily defeated her convention opponents and will also proceed directly to the Nov. 6 general election in the race to replace retiring Sen. Orrin Hatch. Her Republican opponent will be decided during a June 26 primary between two-time presidential candidate and front-runner Mitt Romney and state Rep. Mike Kennedy. Lesser-known Democrats won bids to challenge the state’s other incumbent U.S. House members. Kurt Weiland, a business consultant, and Lee Castillo, a social worker, will compete in a primary for the 1st Congressional District and the right to challenge eight-term Republican Rep. Rob Bishop. Shireen Ghorbani of Salt Lake City will take on three-term Rep. Chris Stewart in the 2nd District. James Singer will represent the Democrats in the 3rd Congressional District. But his Republican opponent — either Rep. John Curtis or ultraconservative former state lawmaker Chris Herrod — will be chosen at a primary after a split vote at the tense 12-hour Republican convention last weekend. The Democrats’ event, which ran much more smoothly and wrapped up hours sooner, was still marked by its own divisions over whether candidates should be moderate or progressive. In the 4th District race, McAdams has hoped to appeal broadly to Democrats, who have no elected member in the state’s all-GOP federal delegation, and to Republicans, some of whom he’ll have to win over despite a district that includes much of the left-leaning Salt Lake County. McAdams’ party competitors, though, lobbed thinly veiled attacks against the mayor and urged delegates to not vote for him because they said he lacked the liberal credentials to turn out progressive voters and defeat Love. “I’m the progressive in this race,” said Darlene McDonald, who finished second. Tom Taylor, another of the candidates, threw his support behind McDonald before delegates had even cast a ballot. But Saturday’s attendees signaled they were solidly behind McAdams, who picked up endorsements from all 16 of the voting caucuses earlier in the day. About 1,300 delegates participated in the full vote with 381 in the 4th District. While debating which candidate to back, some members of the Stonewall Democrats Caucus questioned McAdams’ allegiance. “He completely abandoned the beliefs of his party,” argued one delegate. “I don’t think he’s as progressive as [McDonald] is,” said delegate Todd Bennett, who voted against a motion in the Progressive Caucus to endorse McAdams. However, Bennett said he would support the mayor as the party’s nominee. McAdams ended up getting the Stonewall Caucus endorsement, as well as the Women’s Caucus, which he took by just four votes over McDonald. Some in the crowd wore bright orange T-shirts left over from the mayor’s Salt Lake County race two years ago. McAdams said he is a leader who shows up and finds consensus with anyone, including on homelessness and opioids. He said Love hides from her constituents. “What issues has she been present on?” he said. Wilson’s race was far less contentious. She collected about 81 percent of the vote from delegates, handily knocking out three competitors, including Mitchell Vice, who ran to her left. The two-term county councilwoman advocated for a ban on assault weapons and championed immigration reform that “keeps families together.” She also reiterated, with loud cheers and claps from the crowd, that she is a fifth-generation Utahn — an attempt to differentiate herself from Romney, a Michigan native and former governor of Massachusetts. Like McAdams, Wilson won caucus endorsements from all groups that voted Saturday. She beat progressive Vice of Salt Lake City, Jeff Dransfield of Logan and Larry Livingston of Bountiful, a former vice chairman of the Utah Libertarian Party. Delegates forced one of three competitive multicounty legislative races into a primary election. Voters in the sprawling Senate District 26, which includes part of Park City but also much of northeast Utah, will choose between Pat Vaughn and Eileen Gallagher during the June 26 primary. Meaghan Miller will be the Democratic candidate in House District 54, which includes Heber and also Park City. Only one candidate, Tim Glenn of Green River, participated Saturday and will be the party’s candidate for House District 69. There was nothing close to the animosity seen at the Republican Party’s convention last weekend, and in the end Democrats developed a theme of unity to defeat what they said were harmful policies from the administration of President Donald Trump. In a fiery speech before delegates voted, Democratic National Committee Vice Chairman Michael Blake called on party members to support every type of candidate. Blake, who is also a member of the New York Assembly, said Democrats should move on from past elections and support each other. “Stand up and fight for Democrats in Utah,” he said. McDonald, who got 95 votes in her race, said after her defeat that she hoped McAdams would champion progressive issues during his general election campaign. But either way, she said, she’ll support him. “We have to do whatever we can to flip this seat,” McDonald said. Democrats also united in their disgust of Trump, who overshadowed much of the convention, cropping up during many candidates’ speeches and caucus meetings. As the Stonewall Democrats adjourned, their leader asked attendees to shout out words to describe the president. The loud chorus that responded was mostly curses and laughter. “Jerk” sounded above the rest. “We have to stand up to the divisive rhetoric our president is spewing,” said Lee Castillo, who nabbed 53 percent of the vote for the 1st District House race and now faces a primary. “Donald Trump has thrown our institutions into chaos and diminished our standing in the world,” said Jenny Wilson.